Supreme Housewares prides itself on providing you with a quick processing time and safe delivery of your order. We can ship products anywhere in the United States using the least expensive shipping method. We are shipping from Milpitas, Northern California. 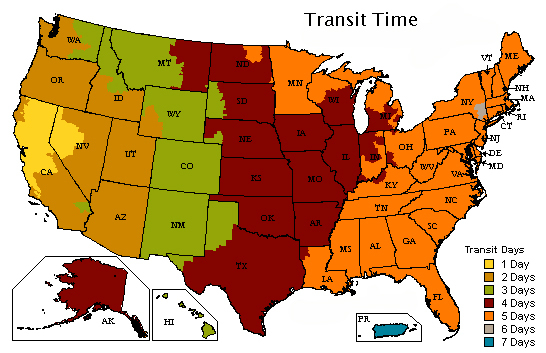 Below is UPS Transit Map for UPS Ground. Please note that delivery time on the UPS Map is in Business days. Please feel free to let us know if you have additional questions or concerns. Customer Service is available Monday thru Friday, 9:00am to 5:00pm (PST). We are pleased to assist you and hope that you will enjoy your shopping experience with SupremeHousewares.com.